Starbucks is encouraging customers to move towards reusable mugs with “Big Picture”, described as a green project and an eco movement. 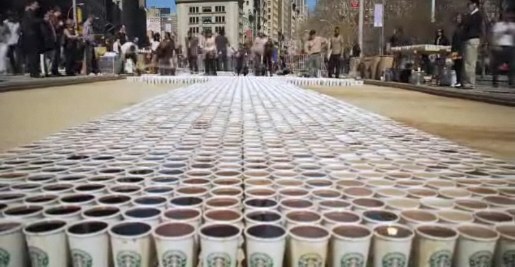 To illustrate the importance of the customer challenge, Starbucks invited thousands of people to exchange their cups for reusable tumblers while creating a symbolic Sequoia mural for Starbucks on March 17 and 18 in New York City. The mural symbolized the collective impact individuals can make, and during this event, 5,000 individuals pledged to continue using tumblers. Customers can visit www.starbucks.com/thebigpicture to enjoy a behind-the-scenes video of the making of the mural and learn more about actions they can take. 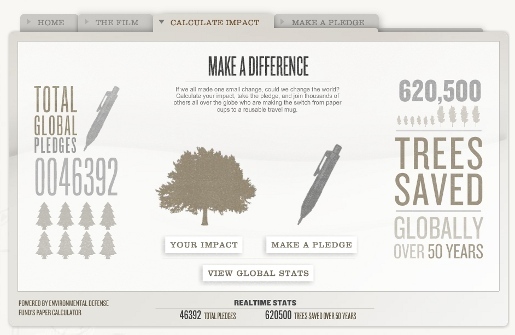 The Big Picture promotional campaign was developed at BBDO, New York, by chief creative officer David Lubars, senior creative director Linda Honan, art directors Kim Haxton and Stuart Matz, director of integrated production Brian DiLorenzo, content producer Nicholas Gaul, executive music producer Rani Vaz. Filming was shot by director Lance Acord via Park Pictures, New York, with executive producer Jackie Kelman Bisbee, line producer Caroline Kousidonis, production designer Clem Price Thomas. Editor was Steve Gandolfi at Cut + Run. Online/conform work was done at Method Studios. Colorist was Stefan Sonnenfeld at Company 3. Music is “Let’s Go Surfing” by The Drums.